A Russian Count commissioned an English architect to design a palace that combined Scottish and English gothic with Moorish architecture - it's hard to think of a more unlikely mix for a successful building. But it did succeed, and with surprising panache and remarkable elegance. The architect was Edward Blore, one of the most well-known British architects of the 19th century - responsible for parts of Buckingham and St James' Palaces in London, and for a large number of other buildings in both England and Scotland. He was a personal friend of Sir Walter Scott and had a keen interest in the architecture of Scottish castles. He was commissioned by Count Mikhail Semyonovich Vorontsov. 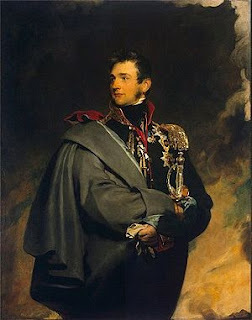 Count Vorontsov's father had been Russian ambassador to London for over 20 years, and the young Vorontsov had been raised and educated in England, and was familiar with English architectural styles. After a long and distinguished military career, fighting in the Caucasus and then against Napoleon, Vorontsov, by then a Lieutenant -General in the Russian army, become Governor-general of Novorussia, which included Crimea. He followed the example of the Duc de Richelieu, Odessa's first administrator, making Odessa his working base, but establishing a private villa on the Black Sea coast in Alupka. Challenges also came of a personally painful kind. The dissident poet Alexander Pushkin, who worked for the Foreign Service, had been sent to Odessa to put him at a safe distance from St Petersburg after he was suspected - correctly - of anti-state activities. Soon after Vorontsov's appointment as governor-general, Pushkin began a love affair with his wife, Countess Vorontsova. Scandal travelled quickly in Odessa and, not surprisingly, the two men did not get on. Pushkin famously described Vorontsov as "half milord, half merchant" - not an entirely fair description of a man who had distinguished himself on the battlefield. Vorontsov responded to the situation by using his position to get Pushkin appointed to a travelling commission to study locust damage in the Dniester region. Pushkin went under protest but reportedly did no work of any value for the commission (he was writing "Eugene Onegin" at the time). By 1824 Vorontsov had reached the end of his tether and, through friends in St Petersburg, secured Pushkin's dismissal from the Foreign Service. This meant that Pushkin had to leave Odessa, ending his affair with Vorontsov's wife, although he wore the gold talisman ring she had given him until he died in a duel thirteen years later. In 1844 Vorontsov, by then 62 years old, was appointed governor-general of the Caucasus and commander-in-chief of the Russian forces there, in addition to his duties in Novorussia. He spent the next 10 years either in military action in the Caucasus or in developing economic projects in both regions. No longer a young man by any means, Vorontsov personally led his forces in a charge during the siege of Shamil al Dargo in the Caucasus, which he had been ordered by the Tsar to take by storm. It has been suggested that he chose to lead his men into battle precisely because he knew that the Tsar's plan to take Shamil in a single assault was doomed to failure. "When Vorontsov ultimately succeeded in extricating himself from an extremely difficult situation without dishonour either to his superiors or to his calling, the Emperor elevated him to the rank of Prince in recognition of his services during the campaign and of the imperial debt owed him". ** Vorontsov died in 1856. Pushkin had accused Vorontsov of being boring and pedestrian. As if to prove him wrong, the palace which was built for Vorontsov between 1828 and 1846 in Alupka is a triumph of the architectural imagination. Vorontsov was, typically, fully involved in the project at every stage, and carefully discussed the details of the planned design with Edward Blore's site architect, William Hunt. 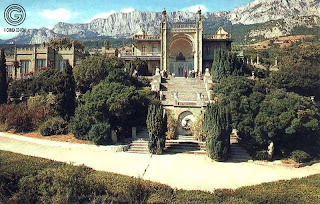 The south face of the palace looks out across the Black Sea towards Turkey, and combines Russian and Moorish elements into a uniquely elegant building standing out against the backdrop of the Ai-Petri mountain. 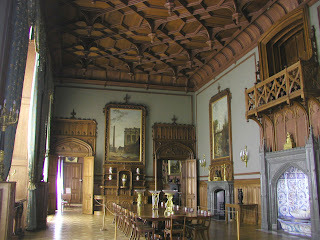 The north side could easily be mistaken for a Scottish castle in the gothic tradition. Somehow, these disparate elements blend successfully into a convincing whole. The palace's luxuriant interior is open to the public - highlights include the Tudor-style dining-hall complete with minstrels' gallery , and many fine paintings including pictures by Crimean seascape artist Aivasovsky. 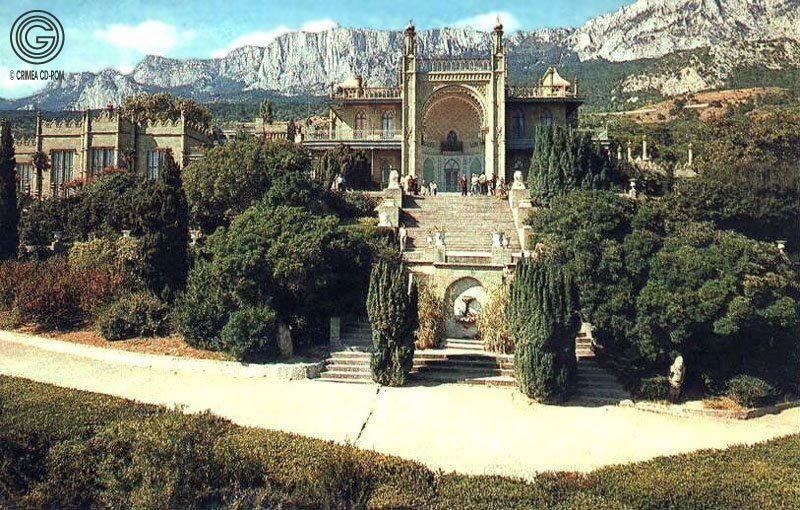 The parkland surrounding the palace is magnificent, with fine views of the mountains and the sea. 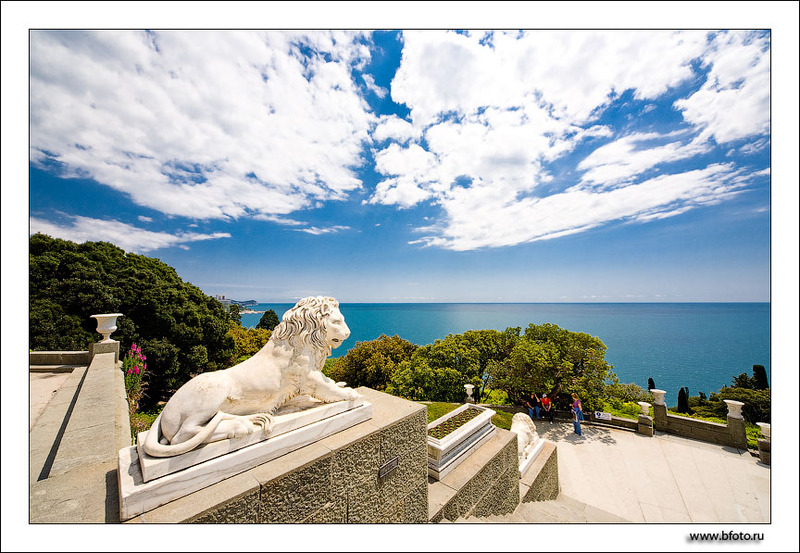 The six famous white lions on the south side are by Italian sculptor Bonani, who also contributed marble sculptures to the Capitol building in Washington, USA.